Rex Mundi wanted €30,000 (c $40,700) or it threatened to publish customers' information on the net. A hacker group calling itself Rex Mundi claims to have acquired user information - email, passwords, mailing addresses, telephone numbers, even favorite pizza toppings - for Domino's France customers, and threatened to post it all on the internet for everyone to see unless paid €30,000 (c $40,700). Domino's France describes this as a credible threat; the hackers, Domino's thinks, are "seasoned professionals" who could probably "decode the encryption system including passwords." Nevertheless, Domino's says it will not be paying the ransom. Rex Mundi made its demands via Twitter, on an account that has since been suspended. "If you're a @ dominos_pizzafr customer, u may want to know that we have offered Domino's not to publish your data in exchange for €30,000," it said. "Domino's Pizza has until Monday at 8PM CET to pay us. If they do not do so, we will post the entirety of the data in our possession on the internet." Domino's has claimed that the incident is limited to its franchise markets in France and Belgium. "Neither we nor the franchise in France will be responding to [Rex Mundi's] demands," says Tim McIntyre, vice president of communications with Domino's. Fortunately for Domino's the stolen information did not include credit card details. The system used in France and Belgium is outdated, and at the moment does not accept cards online. 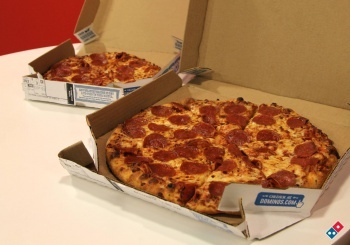 Domino's was in the process of switching over to a US-style system that would accept cards, but that hadn't happened at the time of the hack. Assuming this is the same Rex Mundi, and not a group appropriating the name, then this isn't the first time it has been involved in an extortion hack. In 2012 it demanded what it described as an "idiot tax" - somewhere between $15 and $20,000 - from payday lender AmeriCash Advance. When it didn't get the money, it posted thousands of loan-applicant records it swiped from the lender's servers. At the time of the 2012 hack, Rex Mundi said it admired hacktivists, but claimed, "We're in it for the money, which is also pretty awesome."